For maximum retention of nutrients and digestive enzymes, aim for keeping most ingredients raw; just be sure to chop them into fairly small pieces for palatability. But if you can’t stomach raw broccoli, onions, or garlic, steam them lightly (2 or 3 minutes) before adding to the salad. Within each family, the elements are fungible: substitute shallots for garlic, or Bermuda onions for red onions; opt for cauliflower if you’re out of broccoli; add whichever peppers you have on hand and find appealing; and use any combination of fresh lemon, lime, and orange juice for the dressing. Don’t scrimp on the herbs and spices, either; they provide powerful antioxidants that boost the health factor significantly. Combine vegetables, dried fruits, nuts, and seeds in a large bowl. Place dressing ingredients in a glass jar and shake to combine thoroughly. Pour dressing over vegetables and toss to combine. Note that the acidic dressing acts to break down fibers in the raw vegetables in a manner not unlike cooking them, so some people might prefer this salad after it has sat for several hours in the fridge. 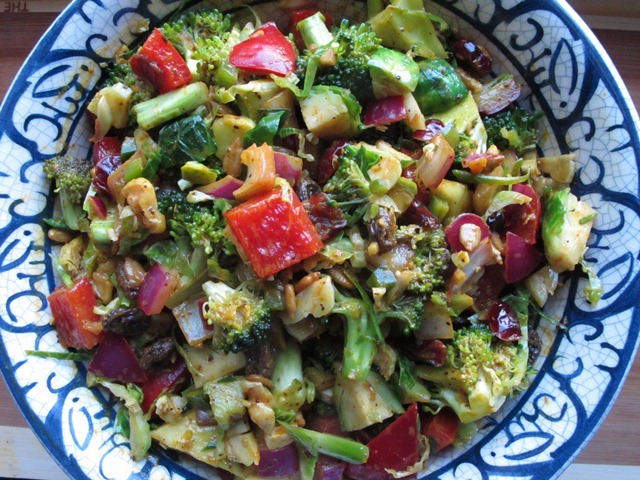 This entry was posted in Salads and tagged allium, bell pepper, brassica, broccoli, Brussels sprouts, capsicum, citrus, garlic, onion, vegan. Bookmark the permalink.